Based on intensive, high-impact experiential learning events delivered to over one million people worldwide, the 8 Power Principles for Achieving Extraordinary Success eCourse acknowledges that we already have what it take to live a life of fulfillment, success and abundance—if we are willing to “wake up” (build greater awareness), take 100% personal responsibility for our lives, and develop greater mastery in communication. This program, delivered digitally online and via email over the next 40 days by personal development expert Robert White with live seminar excerpts from master seminar leader Dennis Becker, provides a comprehensive overview and specific action steps that, when followed, will create your extraordinary life. “With one of the most authentic and altruistic-sounding voices on audio, Robert White makes time-honored personal development principles sound fresh. His presentation is enhanced by live seminar segments by Dennis Becker, another gentle and empowering speaker. These are principles everyone knows, but careful writing and a heartfelt delivery will rivet listeners to the opportunities and happiness they offer. In addition to familiar advice that we be responsible, honest, committed, collaborative, and communicative, the authors emphasize how many ways we deny ourselves life’s gifts by fearing failure or feeling unworthy of success. Made real by the humble authors’ own stories of transformation, these lessons are effective and memorable." The eCourse includes a 53 page “Owner’s Manual” PDF filled with exercises that will expand your knowlege and create actionable plans; plus you'll receive the 8 One-hour Audio Programs via email--one every five days--to keep you on track to more success and fulfilment. Robert is a man with real life experience and he shares and teaches that experience with passion. I think about and use his wisdom frequently. Let Robert's experience help you grow. Highly recommended. 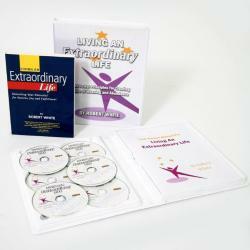 Sign Up to Get GREAT Discounts on Extraordinary People Products! Enter your email address and we will send you a coupon for Right Away! I agree to receive additonal coupons, offers and discounts at my email address. I can cancel anytime by clicking the cancel link at the bottom of any email from Extraordinary People.